We will discuss a recently requested study of the National Research Council focused on CubeSats, and in particular their scientific potential and technological promise. Through this study, several US agencies seek inputs on the current status of CubeSat programs in government, academic and industrial sectors. The study will also make recommendations about additional investments that are needed to further increase the value of CubeSats to the science community. 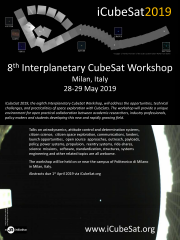 Furthermore, the committee will provide sample priority science goals that describe near-term opportunities, such as providing continuity of key measurements to mitigate potential gaps in measurements of key parameters– and that can be accomplished given the current state of CubeSat capabilities. We want to describe this unique opportunity and solicit input from the CubeSat community at iCubeSat 2015. We are particularly interested in the international viewpoint on these questions of importance to the entire CubeSat community. (*) Any inputs can be submitted to http://goo.gl/forms/DzJndegu9H during the conference and a week thereafter.